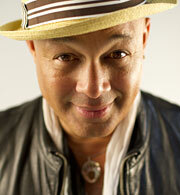 Narada Michael Walden is an Emmy and GRAMMY-award winning producer and songwriter for artists as diverse as Aretha Franklin, Steve Winwood, Ray Charles, Wynonna Judd, George Michael, Mariah Carey, Barbra Streisand, Stevie Wonder, Tom Jones and of course, Whitney Houston. He has earned equal acclaim as a recording and performing artist. As part of our continued celebration of our hit exhibit Whitney! Celebrating The Musical Legacy of Whitney Houston, please join us as we welcome Walden to the Clive Davis Theater to discuss his impressive, nearly four-decade career, stories from the studio and his new book, Whitney Houston: The Voice, the Music, the Inspiration. Following the discussion, moderated by Billboard Magazine Senior Editor Gail Mitchell, Walden will take audience questions and will perform. This special event is part of the Museum's annual fund-raising efforts, with all proceeds benefitting the GRAMMY Museum educational mission.